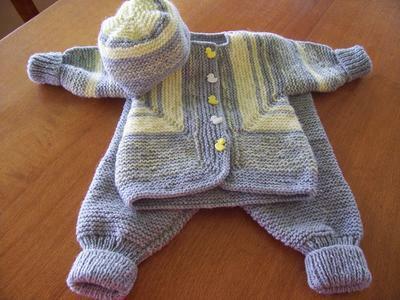 This little set is a combination of Elizabeth Zimmermann’s Baby Surprise Jacket, the Red Heart Happy Baby Leggings ( free on this link http://www.royalyarns.com/fp/fpkntbaby.htm) and a little hat I made up and can’t remember how! This little pink and white set is a top down raglan set, again no seams except for the sleeves! The booties I think are Michelle’s booties, found on Bev’s Country Cottage free pattern site. 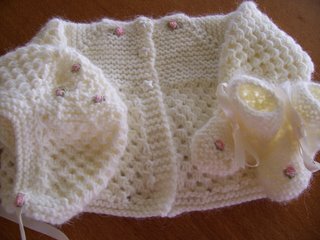 The bonnet is from Precious Layettes, with the jacket stitch pattern on it. 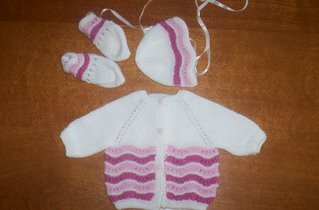 The little set on the right is another of the Precious Layettes Patterns - it is delicious but you do have to concentrate on the stitch pattern until it "computes" in the brain!! I sold this on ebay to a maker of "reborn" baby dolls. The grub roses are all hand embroidered - the yarn is Panda Angoretta. On the right is an idea I had for making a baby shawl in worsted weight from a thread doily pattern. It worked out fine - as you can see it covered my whole dining table!! 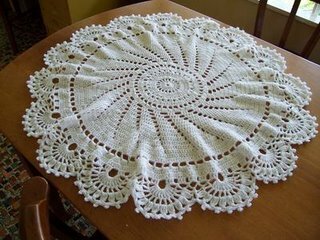 There are so many delightful doily patterns - I must try this again soon!! these layettes are divine! I love the color combinations and the pattern stitches! Beautiful! I did too... Except for #4 (the one on the front cover) Have you? These items are just beautiful! you are so talented, you do lovely work. FOUND IT! I know it is crocheted but WOW what a pretty blanket LOVE this one !